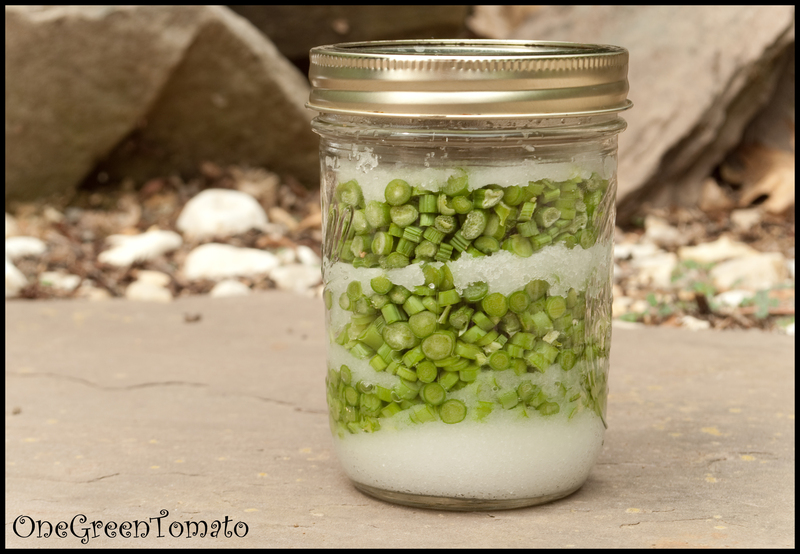 Salt as a means of food preservation is one of the oldest methods still being practiced. Egyptians used salt during the mummification process as well as in food storage, and throughout much of history salt was considered more precious than gold! Salted herbs are very popular, especially in French Canadian cuisine. Wanting to reconnect with a bit of my heritage (kind of obvious with a name like Danielle Renee, never mind the fact my grandfather dropped the “s” from our name because it sounded too French. Dude, you are French.) I thought it would be a fun way to preserve some of this year’s garlic scapes. Obviously this is not a technique I will be practicing very often. Salt preservation works by drawing out the moisture from the fresh herbs creating a brine; this environment becomes inhospitable to harmful organisms, such as bacteria and fungus, causing dehydration through osmosis. This pint jar will last me several years and since I rarely consume anything processed or traditionally canned my sodium intake is very low, so it all balances out. Besides it’s not like I’m going to be sprinkling it on my morning granola! In a clean mason jar alternate layers of chopped herbs and salt, starting and ending with salt. Set in a cool dry place for a month while the brine develops. Use as needed. Once my herbs mature a bit more I may create a blend with rosemary, basil, chives, parsley, oregano and celery. I thought it would be a nice way to flavor soups, veggies and stews.